This chia seed plum jam really is seriously quick and easy to make. Plus, it requires less added sugar than conventional jam recipes, which means you get to spread it really thickly on your toast! The chia seeds are what helps the jam to set - so there's no boiling to precise temperatures or worrying if it'll set properly - just stir them through and in 15 minutes it'll be a perfect jam consistency. Those chia seeds also pack a nutritional punch too, containing lots of healthy omega-3 fatty acids, protein, iron, and calcium. 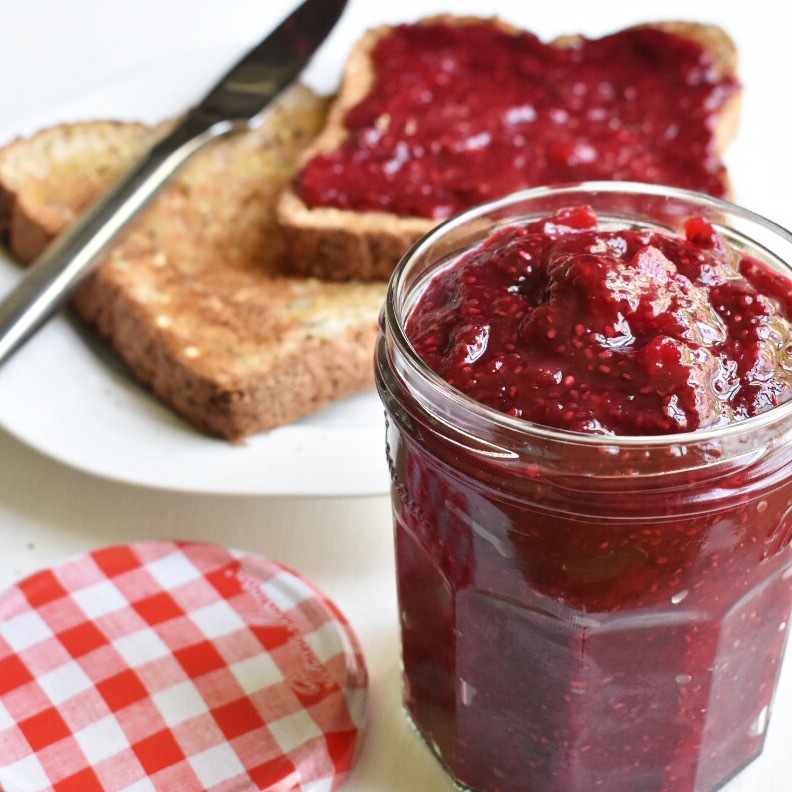 This vegan jam recipe is hugely versatile too - switch the plums for strawberries, blackberries, or raspberries, and stir it into porridge, dollop on pancakes, or even serve with vegan cheese and biscuits! Wash and chop the plums to remove the stones, and stir in a saucepan over a low heat, until they break down and become syrupy, about 20 minutes, mashing them up with the back of a wooden spoon (this only takes 5-10 minutes if using berries instead). Stir in the lemon juice, sugar, and chia seeds, then taste for sweetness (adding a little more sugar if desired). Remove the pan from the heat and leave to chill for 15 minutes, and that's it! If you want to make your jam a little thicker you can add more chia seeds, (just one teaspoon at a time, remember it takes 15 minutes for the seeds to thicken). The jam will also set more once it has chilled in the fridge for a while. Transfer to a clean jam jar, and keep in the fridge for up to two weeks. Although it doesn't last as long as normal jam, it's so quick and easy to make that you can try it with a new fruit every fortnight. I've made this chia seed jam with strawberries, raspberries, and blackberries - each came out really well. Leave a comment to let me know what other fruits have worked well for you!